Saturday was chilly. It really was. I had the pleasure of having been invited to paint to attract attention to the Plano Art Association exhibit that was on display at the Courtyard Theatre in Plano, TX. It was the Fifth Annual Plano International Festival, which is held in Haggard Park, in central Plano. The Courtyard is a fabulous, modern intimate theatre ~ I love the cutout metal walls, the industrial-style handrails, and built-in lighting of this space. But as I was outside overlooking the Festival, I didn’t get to appreciate much of this. Nevertheless, I love working out of doors, and I am always fascinated by the effect the floodlight-like atmosphere of Texas has on my colors. 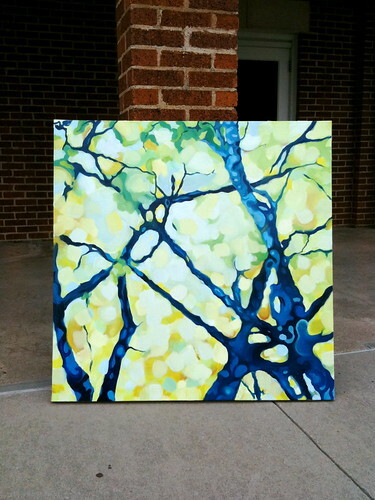 Saturday, I worked on this 40″ x 40″ as yet unnamed abstraction. I really love the light in the piece I created while there. It is from a memory I have ~ it is my perception of trees, in that I focus the viewer on particular aspects I wish them to see. But also, it is my experience of trees through time, through memory. I clearly remember the ripple glass we had in our front door as a child in the Seventies. Looking through it even today is like looking through time, a loop straight back to being three, joyously, fiercely happy, and devastatingly painful. The past is a foreign land. Previous post: October 23rd, 2009. Launch Party!